An Australian parliamentarian, George Christensen MP, proudly wearing a Fourth Doctor scarf, has presented a motion in the Australian Parliament, acknowledging the strong links between Australia and Doctor Who on the 50th anniversary of its debut. Mr Christensen mentioned the important role that a number of Australians have played in the long history of Doctor Who, including C.E. "Bunny" Webber, Anthony Coburn, Ron Grainer, Dudley Simpson, "adopted Aussie" Katy Manning, Janet Fielding and Kylie Minogue. Mr Christensen's speech can be seen here on YouTube. The motion also proposed that the Australian Broadcasting Corporation, Screen Australia and the various Australian state-based film funding bodies consider offering finance to entice the BBC to film the 2015 series in Australia to mark the 50th anniversary of its first Australian screening in 1965. The motion attracted bipartisan support and three other parliamentarians spoke in its favour. The motion and its call for Doctor Who to be filmed in Australia has received some local media, including ABC Brisbane, ABC North Queensland, the Herald Sun and ninemsn. 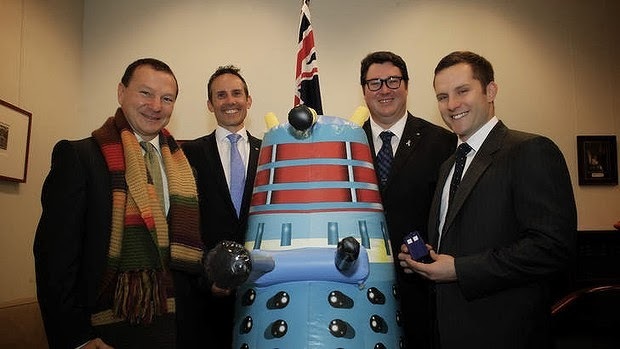 Australian MPs Graham Perrett, Dr Andrew Leigh, George Christensen and Alex Hawke with a blow up Dalek spoke in Parliament on the 50th anniversary of Dr Who. Photo: Andrew Meares, Sydney Morning Herald.